Geshe Tsulga, previous resident geshe at Kurukulla Center, and His Holiness the Dalai Lama, 2002. Photo courtesy of Kurukulla Center. On October 16, 2012, His Holiness the Dalai Lama spent part of the afternoon at Kurukulla Center in Medford, Massachusetts, in the United States, near Boston. His Holiness’ visit was the fulfillment of a request made by Geshe Tsulga, the center’s much-loved resident geshe who passed away in November 2010. An enthusiastic crowd of nearly 2,000 people of all ages – including Kurukulla Center members, Boston-area Tibetans and Kurukulla Center neighbors – listened to His Holiness speak on universal human values and inter-religious harmony. For part of his talk, His Holiness spoke directly to the gathered Tibetan community in Tibetan. He expressed his admiration for how they have preserved their language and culture in exile and said that this, along with the strong spirit of Tibetans in Tibet, serves as grounds for hope for the future. You can read the complete story of His Holiness’ visit in the print edition of Mandala January-March 2013. Geshe Tenley with Sean Gonzalez (immediate left) and Debra Thornberg (immediate right) and team leaders of the event crew, Kurkulla Center, October 2012. Over 200 volunteers helped make the visit of His Holiness the Dalai Lama to Kurukulla Center a great experience for everyone. Photo by Kadri Kurgun. Kurkulla Center, Medford, Massachusetts, U.S., October 2012. Photo by Ali Kaukas. Young ticket holders waiting to see His Holiness the Dalai Lama at Kurukulla Center, October 2012. Photo by Ali Kaukas. Boys in traditional Tibetan costumes dance to remove obstacles in front of His Holiness the Dalai Lama's motorcade as it arrives at Kurukulla Center, Medford, Massachussets, October 2012. Photo by Ali Kaukas. Photos of Lama Zopa Rinpoche and Lama Yeshe with the Heart Shrine Relic displayed around the Kurukulla Stupa at Kurukulla Center, October 2012. Phtoo by Kadri Kurgun. Relics from the Heart Shrine Relic Tour are displayed in front of the Kurukulla Stupa at Kurukulla Center for H.H. Dalai Lama's visit, October 2012. Photo by Ali Kaukas. His Holiness the Dalai Lama arriving at Kurukulla Center being greeted by Lama Zopa Rinpoche (front center), Sikyong Lobsang Sangay (far left), Geshe Tenley (left of Rinpoche) and others, Kurukulla Center, Medford, Massachusetts, U.S., October 2012. Photo by Kadri Kurgun. His Holiness the Dalia Lama with interpreter Thubten Jinpa and Sikyong Lobsang Sangay, Lama Zopa Rinpoche and others, Kurukulla Center, Medford, Massachusetts, U.S., October 2012. Photo by Kadri Kurgun. Members of the Boston-area Tibetan community awaiting His Holiness the Dalai Lama's arrival at Kurukulla Center, U.S., October 2012. Photo by Kadri Kurgun. Kurukulla Center resident teacher Geshe Tenley and Medford mayor Michael McGlynn before the big event, Kurukulla Center, Medford, Massachusetts, U.S., October 2012. Photo by Kadri Kurgun. Kurukulla Center resident teacher Geshe Tenley speaks with the media outside Kurukulla Center, Medford, Massachusetts, U.S., October 2012. Photo by Kadri Kurgun. Young women in traditional Tibetan dress before His Holiness the Dalai Lama's visit to Kurukulla Center, Medford, Massachusetts, U.S., October 2012. Photo by Kadri Kurgun. Wendy Cook and [need name] prepare to MC program before His Holiness the Dalai Lama speaks, Kurukulla Center, Medford, Massachusetts, U.S., October 2012. Photo by Kadri Kurgun. Members of Boston-area Tibetan community and event volunteers gather for photo before His Holiness arrives, Kurkulla Center, Medford, Massachusetts, U.S., October 2012. Photo by Kadri Kurgun. Lama Zopa Rinpoche and Tim McNeil, director of Wisdom Publications, Kurukulla Center, Medford, Massachusetts, U.S., October 2012. Photo by Kadri Kurgun. Nick Ribush, director of Lama Yeshe Wisdom Archive, and Ven. Roger Kunsang, CEO of FPMT and Lama Zopa Rinpoch's attendant, Kurukulla Center, Medford, Massachusetts, U.S., October 2012. Photo by Kadri Kurgun. Medford mayor Michael McGlynn and His Holiness the Dalai Lama with Geshe Tenley and Mayor McGlynn's family, Kurukulla Center, U.S., October 2012. Photo by Cherrie Corey. His Holiness the Dalai Lama speaks for a few minutes in the gompa of the Kurukulla Center, Medford, Massachusetts, U.S., October 2012. Photo by Kadri Kurgun. His Holiness the Dalai Lama, Kurukulla Center, Medford, Massachusetts, U.S., October 2012. Photo by Kadri Kurgun. His Holiness the Dalai Lama speaking in the big tent behind Kurukulla Center, Medford, Massachusetts, U.S., October 2012. Photo by Kadri Kurgun. His Holiness the Dalai Lama greets some audience members after the talk, Geshe Tenley in background, Kurukulla Center, Medford, Massachusetts, U.S., October 2012. Photo by Kadri Kurdun. His Holiness the Dalai Lama greets some audience members after his talk, Kurukulla Center, Medford, Massachusetts, U.S., October 2012. Photo by Kadri Kurdun. His Holiness receiving honorary Medford citizenship and the key to the city of Medford from Mayor Michael McGlynn, Kurukulla Center, October 2012. Photo by Kadri Kurgun. Lama Zopa Rinpoche after offering His Holiness the Dalai Lama a khata, Kurukulla Center, Medford, Massachusetts, U.S., October 2012. Photo by Kadri Kurgun. His Holiness the Dalai Lama outside of Kukukulla Center with Geshe Tenley, Medford, Massachusetts, U.S., October 2012. Photo by Kadri Kurgun. 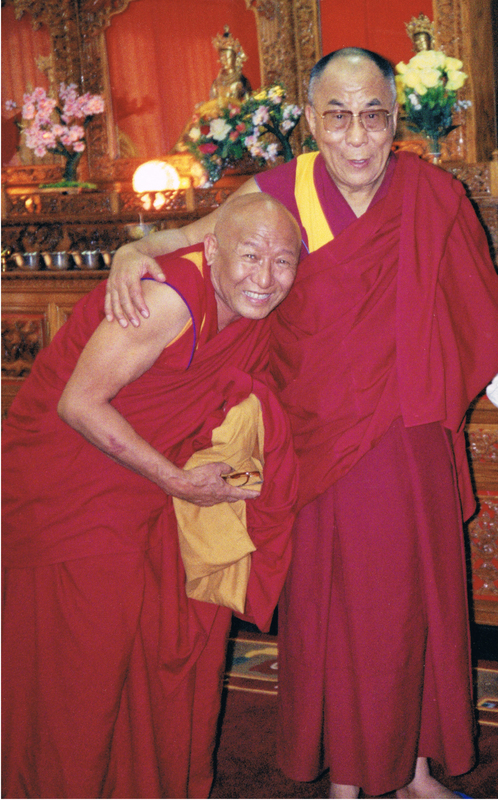 Lama Zopa Rinpoche and Geshe Tenley after His Holiness the Dalai Lama's visit to Kurukulla Center, Medford, Massachusetts, U.S., October 2012. Photo by Kadri Kurgun. His Holiness the Dalai Lama being greeted by Lama Zopa Rinpoche, Kurukulla Center, Medford, Massachusetts, U.S., October 2012. Photo by Devin Jones.